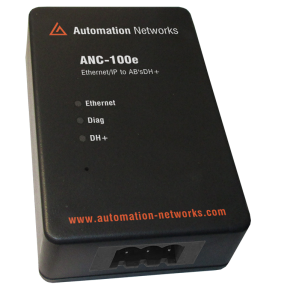 ANC-100e Ethernet/IP to Data Highway Plus Converter $1,195 USD List. The ANC-100e is a pocket-sized, high performance, Industrial Rated Ethernet DH+ Converter. Features include: Ease of Configuration via Web Interface and DH+ Auto Polarity Detection and DH+ Auto Baud Rate Detection. Contact us to discuss your application. All ANC products come with a 30 day trial, no restocking, lifetime warranty. 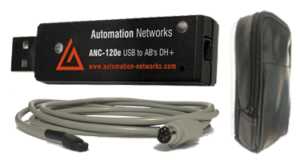 ANC-120e, USB-to-Data Highway Plus, 1784-U2DHP replacement alternative also available using the Controllogix Ethernet/IP Driver feature $995 USD List. 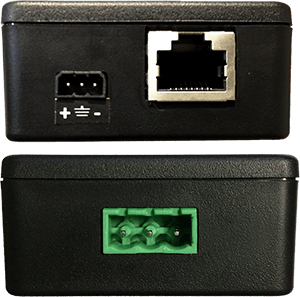 Replacement Compatibility for AB’s 1756 Controllogix Gateway, AB 1784-U2DHP, 1784-KTx, 1784-PKTx, 1784-PCMK, 1770-KF2. The enhanced ANC-100e gateway converter is useful for PLC programming, accessing and monitoring DH+ network from a PC computer. 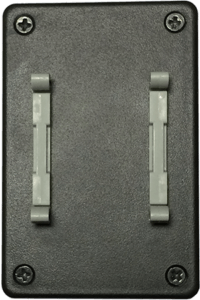 It is has similar replacement features as the Controllogix 1756-DHRIO / 1756-ENBT, and AB 1784 Interface Cards which include 1784-U2DHP, 1784-KTx, 1784-PKTx, & 1784-PCMK. Compatible with all PLC Programming/HMI/SCADA packages including all older versions of RSLINX Classic and latest RSLINX Enterprise. Easy setup: Driver selection is ControlLogix Ethernet driver. Economical: Full function Ethernet-to-DH+ converter listed at $1,195 USD List. Fast Ethernet/IP Connection: Using the RSLINX Controllogix Ethernet Driver. DH+ Speeds: Reliably supports all DH+ data rates – 57.6, 115.2 and 230.4 Baud on communication length exceeding standard requirements. Auto Detect: Default Auto Baud Rate and Auto Polarity detection. Size: “Pocket-sized” convenience with Desktop and Din Rail options. Easy DH+ connection: 3-pin Phoenix Blue Hose connector option or direct 8-pin mini din cable connection to PLC port. (8 pin mini din cable included). 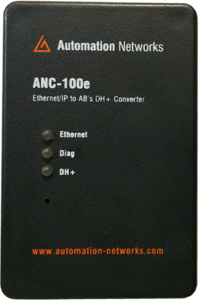 ANC-100e / ANC-120e Matrikon OPC Server Ethernet/IP to DH+ Application Note. ANC-100e / ANC-120e Citect 2015 Application Note. ANC-100e / ANC-120e Citect 2016 Application Note.